Vehicle was provided. Story and images are my own. Have you ever been in a new town, city or suburb and you test out a new car? We just got back from Central Florida, with my family of 5 and right out of the airport we started into our adventure. We got off our flight in Orlando and headed to our car for the week as we were about to test drive the 2016 Mazda CX-5 Grand Touring AWD! It’s time for a new adventure, and excitement abounded, but then my mind drifted and wondered, would all FIVE of us and our luggage fit? What features would the 2016 Mazda CX-5 offer us and what if it rained, or if traffic was horrible. I think anxiety of test driving a vehicle was kicking in, but I did know one thing about the 2016 Mazda CX-5, from test driving Mazda’s before: the comfort of the ride and the safety features that are built into this vehicle would not only be so much appreciated at the end of a Theme Park Day when exhaustion has fully set in. 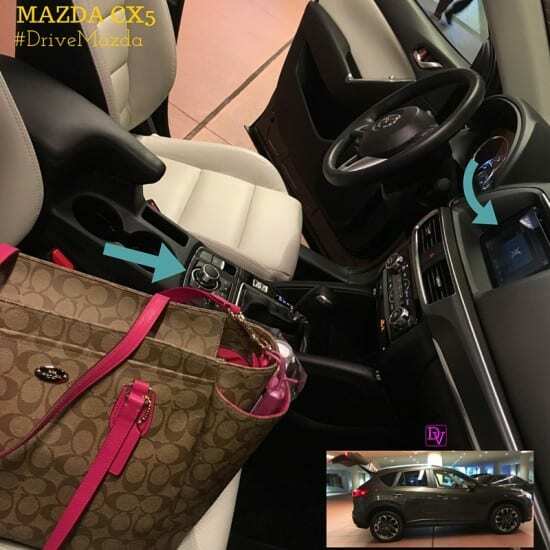 If you are looking for intricate details of the MAZDA CX-5 wrong blog, as I describe the usual functionality we found in an awesome vehicle that is translated into words that most will understand! 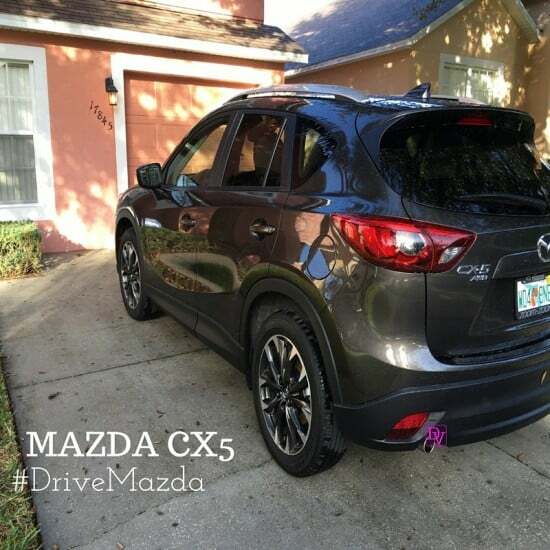 Lavishly live travel out loud and find out about our 2016 MAZDA CX-5 Adventure in Florida as we test drive and enjoy the interior and the ride comfort. That’s the 2016 CX-5 Grand Touring AWD and yes we fit with ease. In fact, that is all of our luggage x 5 people and we still had room! 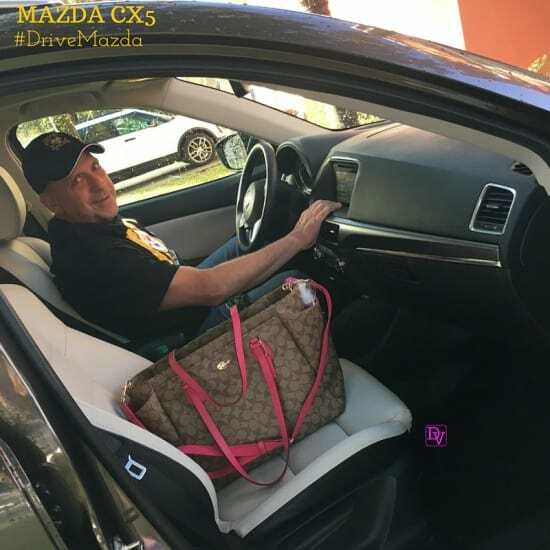 We got in quite fast, as we had our first event to attend as soon as we arrived in Florida at Carrabba’s so acclimating to the inside of the vehicle with a rapid pace was necessary and very easy. 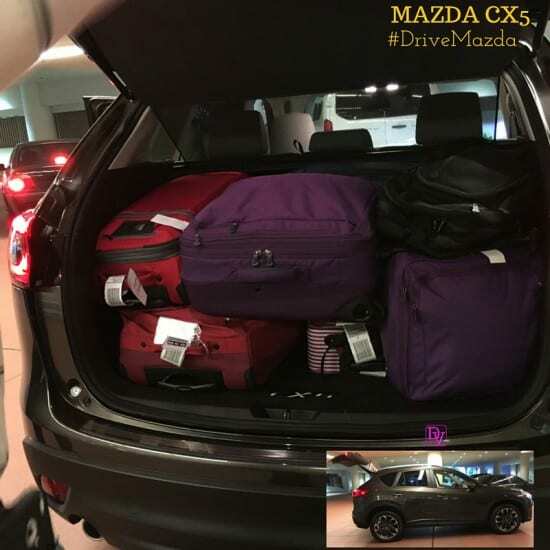 The Mazda CX-5 had plenty of room for all 5 of us, our luggage and even a place for that ever-present bottle of water! 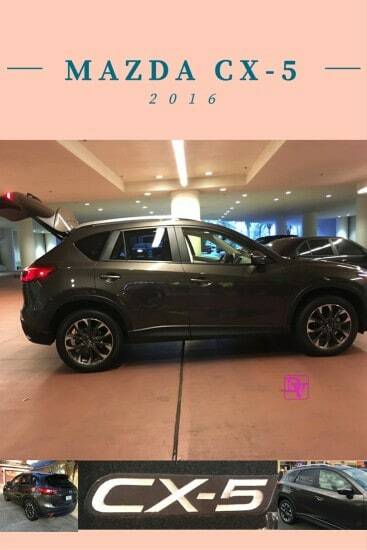 The 2016 Mazda CX-5 Grand Touring we were in offered the complete Grand Touring Tech Package: Navigation System, LED headlights, Adaptive Front Lighting, LED Daytime Running Lights, LED Foglights, LED Combination Talllights, Smart City Brake Support and Auto-Dim Mirror With Homelink. The Navigation system was the first tool of the trade that we would be using as we got ready to leave the airport and head out to dinner. The arrows show you the Navigational System and how we SELECTED our choices is the button on the console. This was fabulously easy to use and so helpful in getting around an area we were not all too familiar with. As with any family vacation, we had the need to make a few stops before we could actually get the party started and with tweens and teens, well our first stop was at PUBLIX. What I want to share with you are things people take for granted but really make this car ‘snappy’ for lack of a better word. What am I crushing on in this photo, besides great memories and the want to just run back to Florida for vacation? The 19″ Allow Wheels which totally deck the ride out, and take note of the privacy glass in the back windows. Often what cars lack is privacy glass in the back for the littlest passengers who then become victim to the window blazing sun, but totally not the case in this car. My kids like to think of this as their personal ‘Limo’ that no one can see into because of the privacy glass! Also I wanted to mention how well lit the interior of the vehicle is. Trust me we have been in many cars with all of our travels and some are just not lit well on the interior, but this is awesome and you can see for yourself, look how PINK my hoodie show tossed in the front-seat. Speaking of seats, you may not think that it gets cold in Florida, but January is a gamble with weather. We got there towards the end of the month and each day was different as we had temperatures that hit high 70’s and low 40’s, so it was all over the place. Which brings me to my favorite feature inside the car: Heated Front Seats! Trust me, with the wind blowing, and the heaviest clothing item I had available at the moment being only a hoodie, the heated seats kept the rest of me toasty warm! What’s up with my husband behind the wheel? How about comfort. My husband is 6 Feet Tall and by no means small, but I took this photo so you could see that there is head and leg room and quite comfortable on the interior. The steering column is tilt & telescopic so easily customizable to whoever is driving. Additionally the steering wheel is leather wrapped and offers the audio, cruise and Bluetooth controls right at your fingertips, which is a bonus when driving in traffic. The Driver’s seat offered power lumbar support and an 8-way adjustable seat! Let me ‘gal talk’ this for a moment. You all know I am a petite 5′ 2″ and I have to tell you this car is so perfect for me from seeing over the dashboard, to loading the trunk, everything was within arms’ reach. 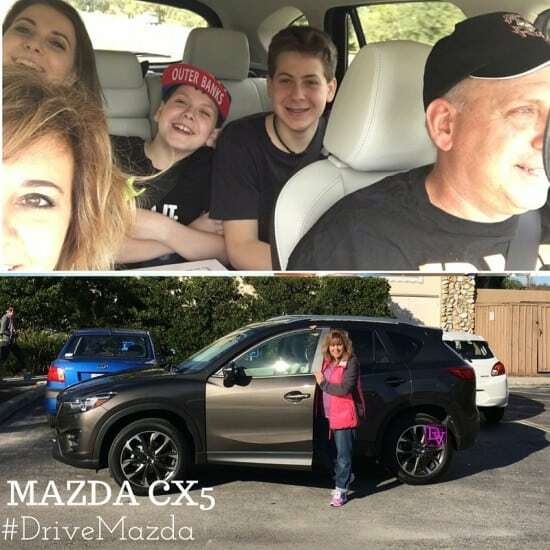 The kids were happy all the time, and they are tweens and teens, as they were comfortable and I knew that the Mazda CX-5 offered great safety features like Blind Spot Monitoring when I attempted merges, rearview camera made backing up a dream, especially with all the heads across my back view area. The trunk area offered plenty of storage for our days at the park and all of our purchases and backpack hauling. I think this Tweet sums up our awesome experience with the Mazda CX-5. There were 5 passenger, 3 point safety belts, so everyone was ‘BUCKLED UP’ just like Momma Bear used to do when they were in car seats. There are front side-impact airbags, as well as front and rear side air curtains, so I felt good getting in with the whole family. The safety features like the blind spot monitoring are really relevant when you are in Florida traffic leading into the Theme Parks and our of the Theme Parks. Before you get in, everyone is hurrying up to BE THE FIRST people there (which never happens) and the blind spot monitoring lets you know not to get into that lane because the car you did not see that just floored it is suddenly there. On the way out of the park, everyone is exhausted as you walk all day and fresh air is a free sleeping pill. The result in the parking lot and leaving the Theme Parks are a bunch of tired people who you may or may not see in the lane you choose to merge into. The Blind Spot monitoring lets Momma Bear know not to take her turn! Yes the car fits a family of five and there is plenty of room for bags, luggage and groceries. The Gas mileage rocked out at 26 MPG (Yahoo!) and the ride is smooth sealed up with tons of safety and fun features. I know I forgot to mention the moon roof but it was there and enjoyed by all! The options on the vehicle allow you to customize your ride and make it the car of your dreams. 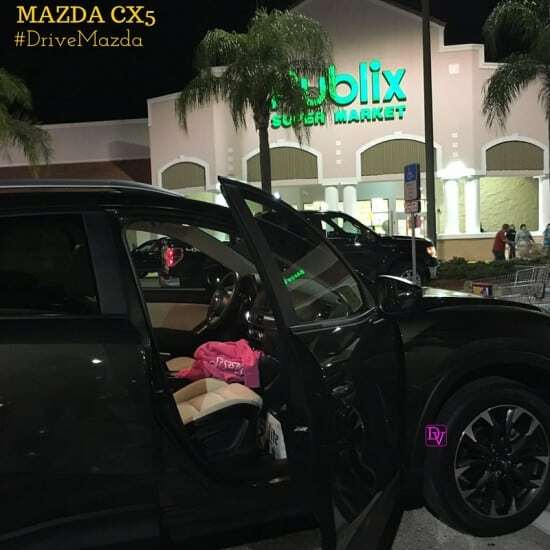 That’s my story of how we lavishly lived travel out loud and in our 2016 MAZDA CX-5 Adventure in Florida! I love this car, and trying to move back to FL myself, looking at this same model. This is such a great looking vehicle. I would love the blind spot monitoring. I’ve actually been looking into getting this car! I have the Mazda 3 right now! That Mazda CX-5 is breath taking! Someday we’re going to move towards having a family vehicle and once we do, I can totally picture us gearing toward this. Love the spacious compartments too and the overall aesthetic. With a family of five also, it seemed like there weren’t a whole lot of options for us outside of vans. I love how sporty this Mazda is. Just a great family car while still being way cool. I love this car and I love Mazda’s in general! The trunk space is a plus for me! My oldest son had a Mazda and he loved it. I haven’t driven one, but I’m def. not adverse to it. This one looks great. That is a really nice vehicle. I’ve been looking for a new vehicle for my family. I’ll have to check this one out. It looks like it’s got a lot of great space. The 2016 Mazda CX-5 looks like such a roomy vehicle. It would be perfect for a family. I am looking to replace my car. I will have to take a 2016 Mazda CX-5 out for a test drive. I have never owned a Mazda previously, but I know they make a fine product. I can’t believe you were able to fit all those bags and five passengers in the vehicle. Looks like an affordable SUV, but very classy looking. What a fun adventure! I love that you really took the car for a ride to learn about it too. I love the sporty design of this car, and can’t get over how much luggage you easily fit into the trunk. This looks like a fantastic vehicle to own and love that you shared your experiences with this particular mazda! This looks like a great vehicle. I am looking to purchase a small “crossover” SUV in the next year or so. I am going to check out this Mazda. BTW, I love your purse in the front seat!! It’s always great seeing reviews for rental vehicles. It gives you an idea of what you could need and want and the reviews are honest! Thanks for sharing! Mazda could make the list for our family! Looks like a really great, roomy vehicle! iI’ve heard such great things about Mazda’s. We don’t drive so I haven’t a clue but it looks great! What a handsome car and I love how roomy it is! I have 3 boys and this would be perfect for us. Wow, I can’t believe it sits that many. I love the interior and exterior design! What a great vehicle and it certainly has a lot of room for storage. It also looks like you had a lot of fun. Looks like you guys had a blast! I have always liked Mazdas, they are a great car! Wow! I love how roomy that is. I definitely like to hear more about the functionality than the technical stuff. Looks nice! This vehicle looks seriously awesome! We love Mazda’s and this model sounds like a really great family car. We are in the market for a crossover SUV and Mazada is one brand we have yet to explore. I love all of that rear space and those rims are fierce too! My daughter has a Mazda. Not the same as this one, but it is very nice, very dependable and very comfortable. Looks like a great vehicle when it fits both you and your husband. That’s always my issue since I am quite petite, finding something that works for both myself and my husband. What a beautiful SUV! We are in the market for a new one, we will go check it out! That Mazda looks awesome. I really love the gas mileage! Would love to have that car! Wow, looks like an awesome car. We had a Mazda for a long time and it was a really great car. That CX-5 looks fantastic. I have 3 kids, and they’re all in different activities, so that trunk space is great. My dad has this car and really likes it! He raves about it actually.